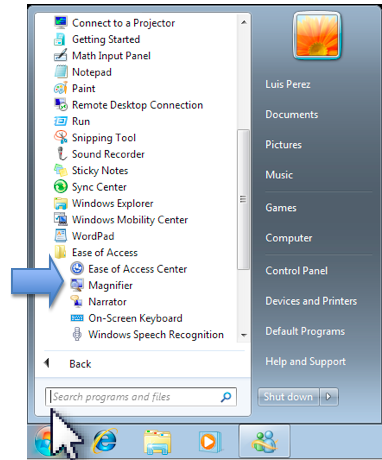 Windows 7 includes a Magnifier that can magnify the area around the pointer for people who have low vision. Choose Start, All Programs, Accessories, Ease of Access, Magnifier. The Magnifier window will appear at the top of the screen. Drag this window away from the edge of the screen to make it a floating window you can move to any location on the Desktop. To dock the window again, drag it back to the edge of the screen. To access the options for the Magnifier, click on the Magnifier icon. In the Magnifier Options window, use the plus and minus buttons to adjust the amount of magnification. To close the Magnifier, click on the X to close the Magnifier Options window.